Belmont Park is a major thoroughbred horse-racing facility. It is the world famous home of the Belmont Stakes, known as the “Test of the Champion” and is also the third leg of the Triple Crown races. 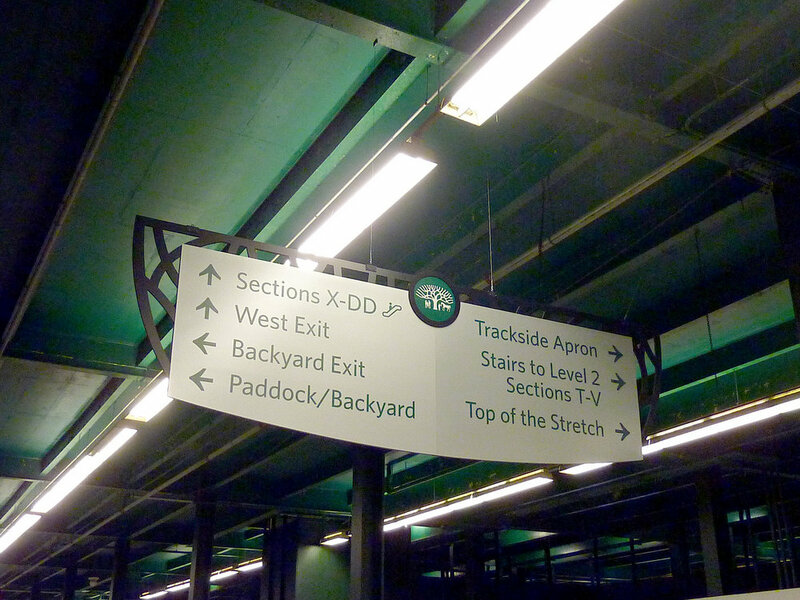 In preparation for the 2013 Belmont Stakes, the New York Racing Association desired a design-build team to create and fabricate a signage and wayfinding program that would direct and inform its visitors. As NYRA anticipated the Belmont Park facility to change within the near future the signage was to be a temporary system. Tangram Design, in coordination with Big Apple Visual Group, designed, fabricated, and installed a temporary signage and wayfinding program for Belmont Park’s Clubhouse, Grandstand, and Paddock areas. Understanding that Belmont Park and its brand has become very recognizable throughout the years, it was important to ensure that the signage and wayfinding program developed reflect this character.